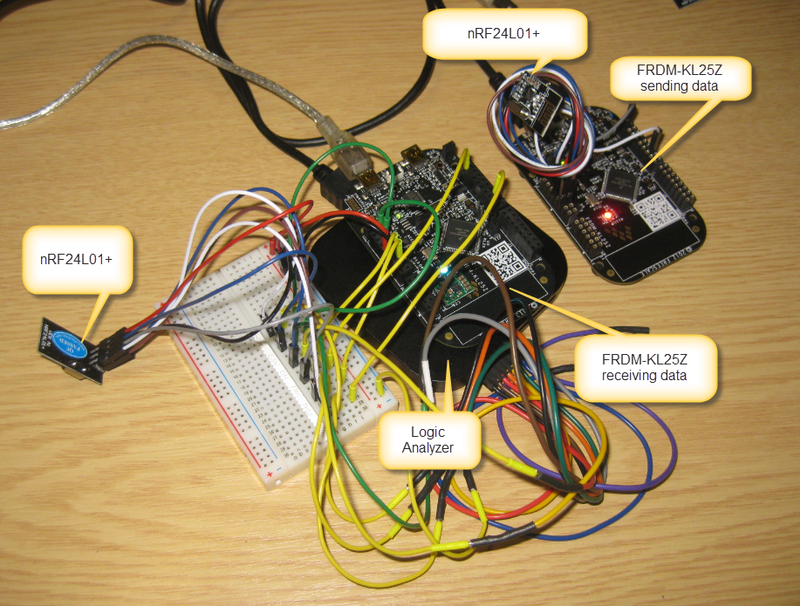 So here is what I have documented while developing my first application with two FRDM-KL25Z and two nRF24L01+ modules……. Nordic Semiconductor has this nRF24L01+ ultra low power 2.4 GHz ISM band wireless solution device. ❗ Note that the ‘+’ version is the newer one and recommended to be used. Be aware that some module vendors still might sell the non-+ version. Simple 8 pin (7 pin without IRQ) SPI interface: VCC, GND, CE, CSN, SCK, MISO, MOSI and optional IRQ. ❗ The supply voltage is really up to 3.6V. Using a supply voltage of 5V will destroy the module! ❗ If you search the web, many other vendors are selling this module too, for less than $5. CE: Chip (RX/TX) Enable, high active. If high, module is either sending or listening. CSN: Chip Select Not, low active. If low, the chip responds to SPI commands. This is actually the ‘real’ chip select signal, and is easily confusing with CE which enables/disables the transceiver radio part. 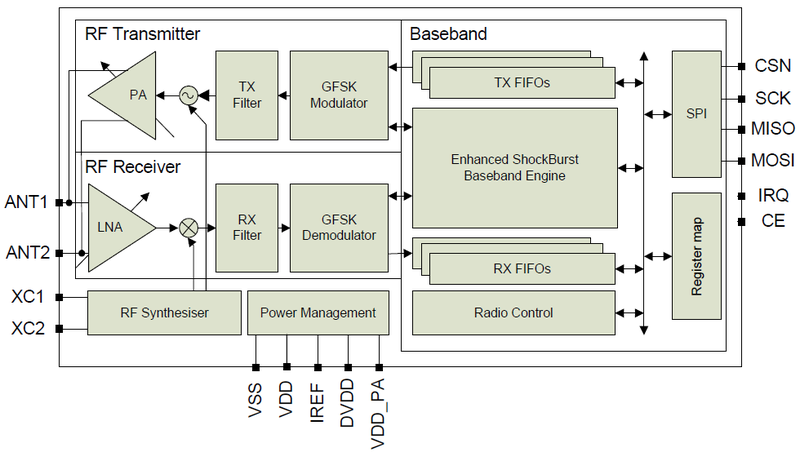 SCK: SPI Shift Clock, up to 10 MHz. MOSI: Master-Out-Slave-In, used to shift data from the microcontroller to the device. 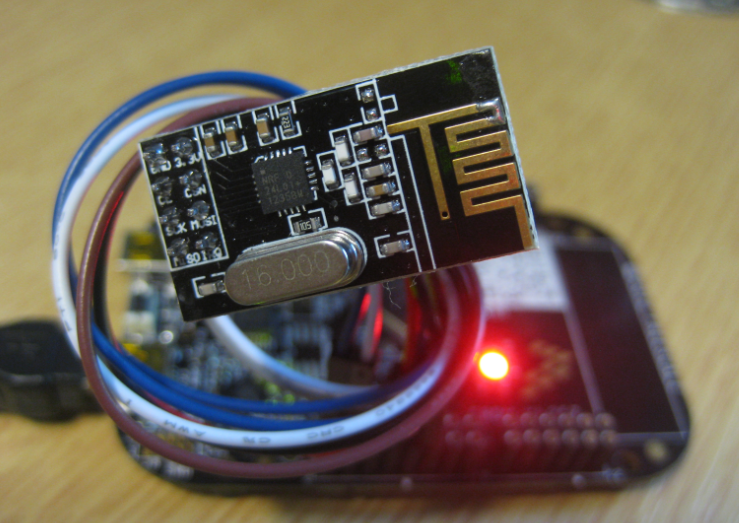 MISO: Master-In-Slave-Out, used to shift data from the device to the microcontroller. 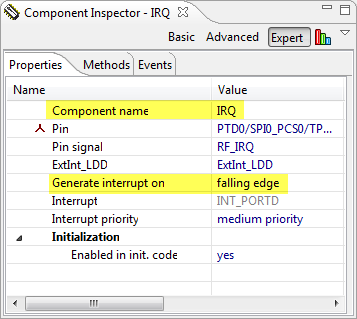 IRQ: Optional Interrupt Request pin. Signals RX/TX status like packet sent or received. 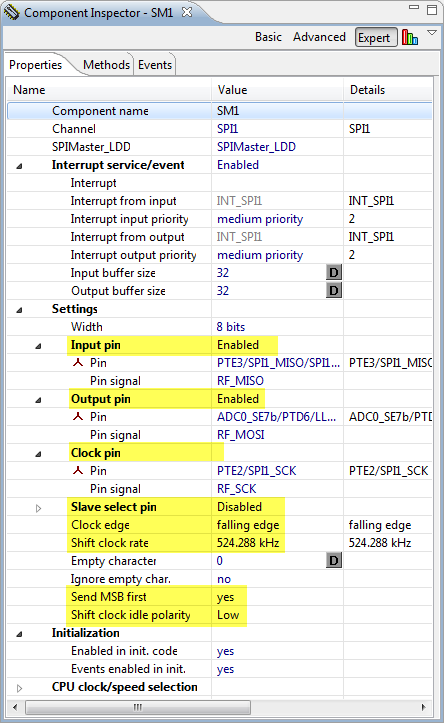 Bit/Byte order: The SPI needs to be configured to send the Most Significant Bit First. within a byte. For multiple data bytes, the Least Significant Byte needs to be shifted first. Time to get some hands-on! For this I’m using two RF modules with two FRDM-KL25Z. One board is sending data to the other, and they indicate with LED blinking proper operation. I’m using interrupts, but to keep things simple, I will only set a flag in the ISR I will do the radio processing outside of the interrupt service routine. 💡 Just setting a flag in the ISR keeps the interrupt service routine short and sweet, and I do not block further interrupts by accessing the radio module over the SPI bus. Additionally I use the SPI bus with interrupts, so doing interrupt-based SPI within another interrupt needs careful interrupt level planning. To keep things simple, I will not do this here. Make sure you have any extra components loaded (e.g. Wait and LED, see here). Create a Processor Expert project with the wizard (File > New Bareboard Project), then select your CPU and enable Processor Expert. Add the Wait component to your project. It is optional, and I’m using it in the demo application to wait for a given number of milli-seconds. Alternatively you can burn cycles in a loop. Add LED components to your project as needed (see this post). I’m using them to indicate the TX and RX status. Alternatively you can use BitIO component instead, or left it out. Now I’m going to add the components for the hardware connection to the module. If you are going to use different pins, then assign different pin names (of course). 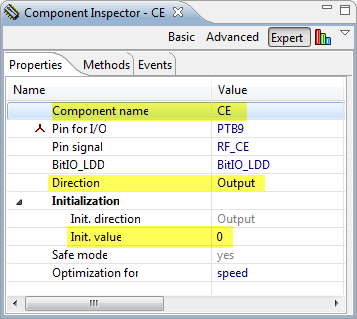 Add a BitIO component for CE: It is configured as output pin with initial LOW value. LOW means ‘not sending/listening’, so this is a good initialization value. 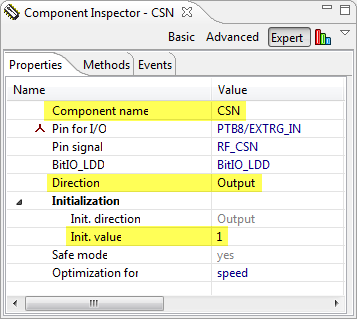 Add a BitIO component for CSN: It is configured as output pin with initial HIGH value. CSN is pulled LOW to send commands to the transceiver. 💡 In above settings I have configured an Input and Output buffer size. This would allow me to send data in blocks. To keep things simple, I will send in this tutorial the data to the SPI character by character. Not ideal from a performance point of view, but again: we keep things simple. Once things are working, it is time to optimize things. The content of the files are posted at the end of this article. I’m explaining now what needs to be done to send and receive data. What is common is the initialization code. * \brief Initializes the transceiver. R/W Enables continuous carrier transmit when high. R/W Set RF Data Rate to 250kbps. See RF_DR_HIGHfor encoding. I’m going to use ‘auto acknowledge’: with this, the sender will transparently handle an acknowledge. For this I need to configure the retry time if communication fails for 750 μs and 15 retries. 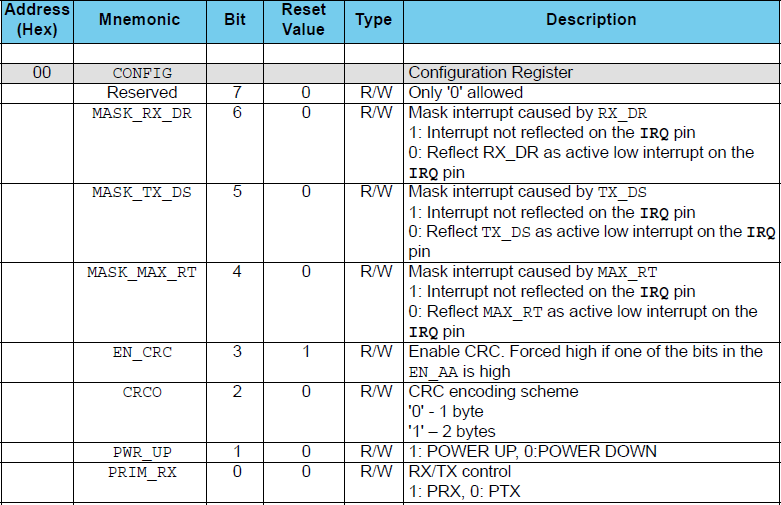 Both macros write the CONFIG register: it enables CRC (EN_CRC) with 2 byte CRC (CRCO), powers up the transceiver (PWR_UP). The only difference between sender and receiver is the PRIM_TX flag which tells the configuration register to be the sender. ❗ Note that there are 3 ‘interrupt mask’ or ‘interrupt inhibit’ bits. I’m intentionally *not* setting these bits because I want to use interrupts (more later). The last part is to set the CE pin either low or high: setting it HIGH will let the receiver start listening. The CE pin is set high on the sender to initiate sending the data. With this, we are ready to send and receive data :-). What it does is first flushing the TX FIFO with writing to the FLUSH_TX register, just in case there is still something in there). Then it writes the payload data with W_TX_PAYLOAD. ❗ The number of bytes transmitted as payload needs to be the number of payload bytes specified above with the write the RX_PW_P0 register! 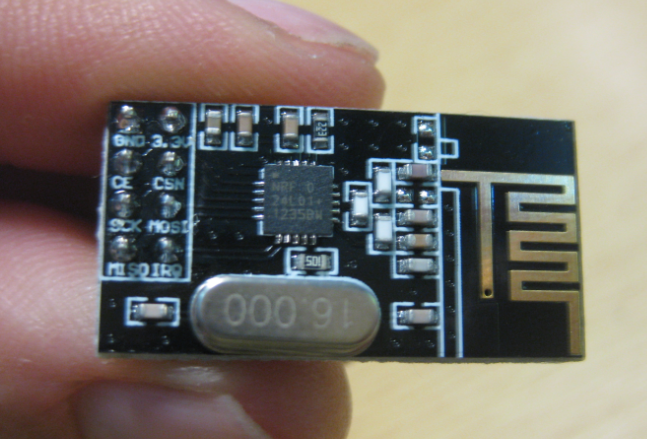 Finally it sends a pulse with the CE pin of at least 15 μs to initiate the sending of the data over the air. Resetting the interrupt bit is needed to get the IRQ line back to HIGH. The zoom below shows that sequence in more details: It queries the status (0xFF instruction) which returns 0x1E (max retry reached, all FIFOs empty). Then it uses 0x27 command to reset the 0x10 bit. * \brief Receive the Rx payload from the FIFO and stores it in a buffer. * \brief Read multiple bytes from the bus. With this I’m able to send and receive data. The source code of this application is available on GitHub here. 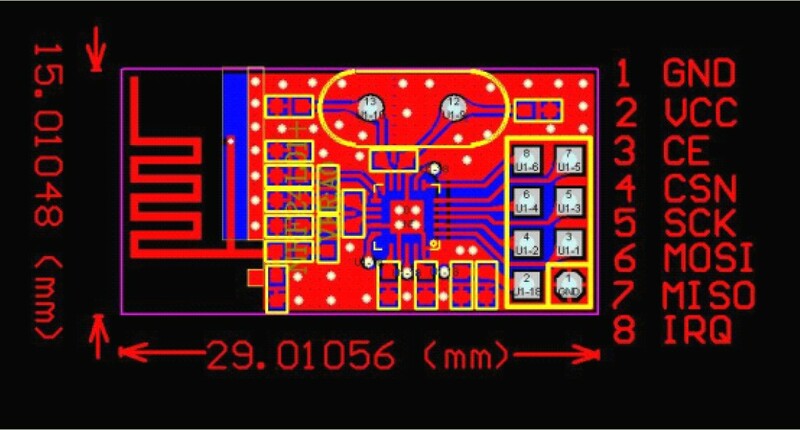 This tutorial does not cover all the powerful aspects of the nRF24L01+, but should get you up and running quickly. I plan to add more functionality in the future and to create a dedicated Processor Expert component for this RF chip. Until then, I hope this tutorial is useful for you. This entry was posted in Boards, CodeWarrior, CPU's, Embedded, Embedded Components, Kinetis, KL25Z Freedom Board, Processor Expert, SPI, Tips & Tricks and tagged CodeWarrior, codewarrior project, Embedded Component, freedom board, Interrupts, KL25Z Freedom Board, open source projects, Processor Expert, software, software project, technology by Erich Styger. Bookmark the permalink. sir can i know whether any other rf transceivers are available whose transmit and receive power is very very low less than micro watt and it should have specification as 802.15.4 in 2.4Ghz. its urgent for my project. Your requirements is rather vague, and the transmit power depends on many factors (effective transmitted, antenna output, etc). Have a look at the 2.4 GHz offerings from TI, Nordic Semiconductor and NXP. hi maria, if it isn’t too late, take a look at the nRF24LE1 from Nordic. it has the radio AND a fast-ish C51 8-bit microprocessor that runs off a coin cell, $3.50 fully functional board on ebay. tons of A/D. there’s a GCC compiler and the “native” keil compiler (free for smaller programs, kinda expensive when you go bigger). there are a few versions available on ebay. start with the one with the pins, then go to the 2/3rds sized board, same functionality. they’re about the size of your thumbnail :-). Can I write that part without “x” in brackets? Why are some funtions “static”? could they be just “uint8_t” or “void” etc.? Is “ERR_OK” reserved word o value? Why do you use #if #else #endif in some functions? Could you explain them to me, please? these are undoubtful very basic C programming questions, so I hope you have learned C programming at least a bit :-). 2) Static functions mean they have static linkage in C. Static should be used for functions which are not used from other modules. 4) These are C programming language preprocessor directives to turn on/off some parts of the code instead testing this at runtime. how do “Input buffer size” and “output buffer size” work in an interrupt? A SPI interrupt occurs when FRDM have tramitted o received the amount “Input buffer size” or “Output buffer size” that you specified? the SPI input and output buffers are protected by critical sections, so they are interrupt safe. 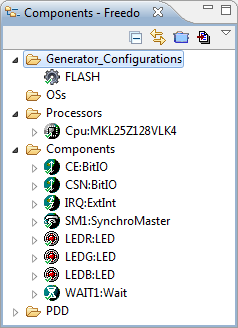 If you are sharing the SPI bus with multiple devices, then you need to have a critical section for the bus transfer. If this is your question, then have a look e.g. at https://mcuoneclipse.com/2014/05/26/tutorial-data-logger-with-the-frdm-k64f-board/. Hi! I just recently stumbled upon your blog and it is really interesting. Is there a way to implement 2 transmitters to only 1 receiver? Just looking for advice so I can get on track. 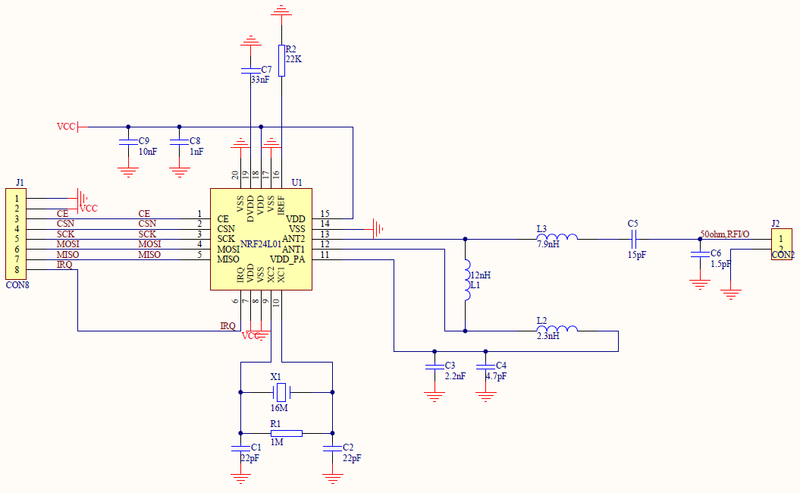 Yes, check the Nordic Semiconductor nRF24L01+ data sheet, chapter 7.6 Multiceiver: using pipes, you can connect up to 6 devices within an address range. The device does not have a real broadcast, but with re-transmitting you can even reach many more devices even if they share the same address. You can me help? I do not understand, trying read a setup_aw register of the nrf24l01+, for example, but I not has success, because no data received. Where is my error? Your CSN high time seems to be very short. Are you within the timing as specified in the data sheet? I tried your sequence with my code, and the transceiver properly returns the register value for me. I am currently working with the module and I noticed that the function RF_RxPayload does not do what is seems to. I understand that this function reads the payload( 1 – 32 bytes). The read operation always starts at byte 0 and then the payload is deleted from FIFO after it is read. But when I try to send a shorter payload after a long one, the rest of the first payload is kept. I wonder if this is a problem of missing configuration? I will appreciate if you could give me a hand on this. Yes. The transceiver can send and receive, and you can switch from Tx to Rx and back to Tx again. Hello Erich, I’m trying to implement your tutorial, if you can help me with a question, how do I communicate the two boards? Have that one set to 1 for the sender and to 0 for the receiver.